Home > News > News > Cool Additions to Dance Explosion Website! 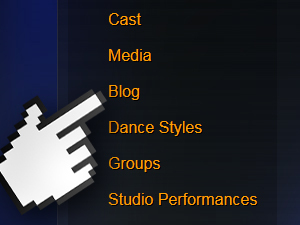 Cool Additions to Dance Explosion Website! Have you visited our Dance Explosion website lately? We’ve just added two fun features we think you’ll like – a behind the scenes blog and individual videos of our super-talented cast. We’ll keep you up-to-date on some of the cool stuff that’s happening around the Theatre as we put this remarkable show together, and also give you the chance to hear from the performers themselves. Don’t wait – click here to check out all the great pages on our Dance Explosion website! Click here to purchase your Dance Explosion tickets now!